Former Kansas University point guard Sherron Collins, who has been rehabilitating a sprained knee that sidelined him at the end of the 2011-12 Turkish Basketball League season, has decided to relocate from Chicago to Lawrence to get in what he hopes will be the best shape of his life. 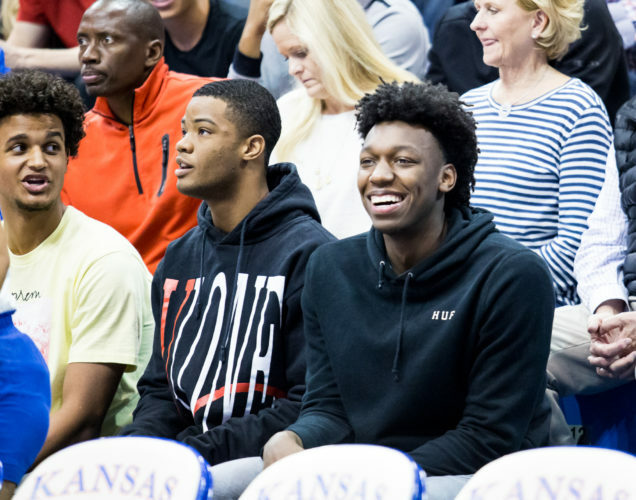 “I’ll be here all summer,” the 5-foot-11, 220-or-so-pound Collins said with a smile after playing sparingly in the Red (alumni plus some current KU players) Team’s 64-57 loss to the Blue squad (all current players) on Wednesday in front of 800 Bill Self campers in Horejsi Center. Collins, who missed five shots without a make, said Hudy is the key to his possible return to the NBA. 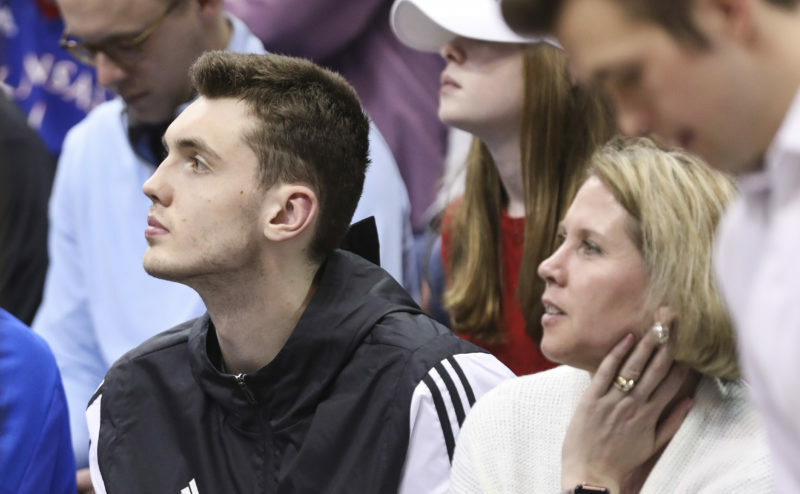 Collins played sparingly for Charlotte two seasons ago before getting cut and moving to Turkey, where he averaged 10.6 points a game for a team in Ankara. The 25-year-old Collins said he’s going to play summer league basketball for a yet-to-be-determined NBA team this July. Of Turkey he said: “It was all right. It was a different chapter of basketball over there, not the same as the NBA, a little rougher, actually. I think it prepares people for the NBA. Collins had discovered the “Call to Prayer,” which takes place several times a day in Turkey. Langford scores 24: Former KU guard Keith Langford, who played for Israel Maccabi Tel Aviv last season, scored a game-high 24 points for the losing Red team. 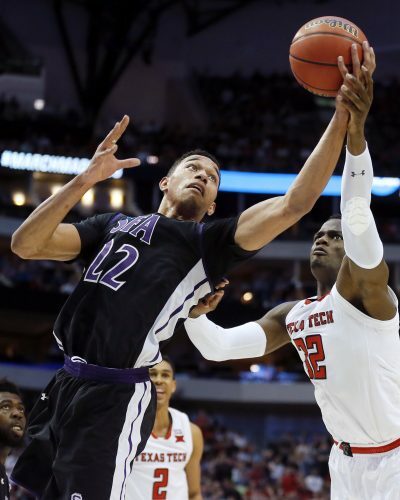 For part of the game, he guarded his brother Justin Wesley, who returned the favor and guarded Keith. “It was interesting. A couple times I had to do an ‘old man foul’ because he’s incredibly athletic,” the 6-4 Langford said of the 6-9 Wesley, who scored four points, including a vicious dunk off a pass from Naadir Tharpe that gave the Blue team a 60-54 lead in crunch time. “He’s a lot bigger than me. It’s interesting to see him grow and develop into what he’s become,” Langford added. At one point, Langford called for Wesley’s teammates to pass his brother the ball in the paint. Tharpe hits for 10: KU sophomore point guard Naadir Tharpe scored 10 points for the winners. He drilled a clutch three that gave the Blues a 56-52 lead and fed Ben McLemore (16 points) for a vicious dunk that gave the Blues a 62-54 advantage. McLemore scored what proved to be the winning bucket off a rebound, erasing a 52-51 deficit. 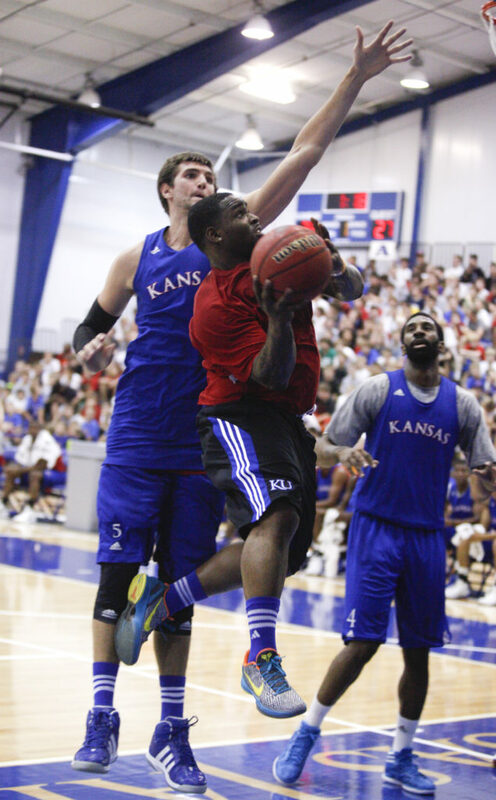 Doyle’s day: KU freshman Milt Doyle hit two threes and scored eight points for the winners. 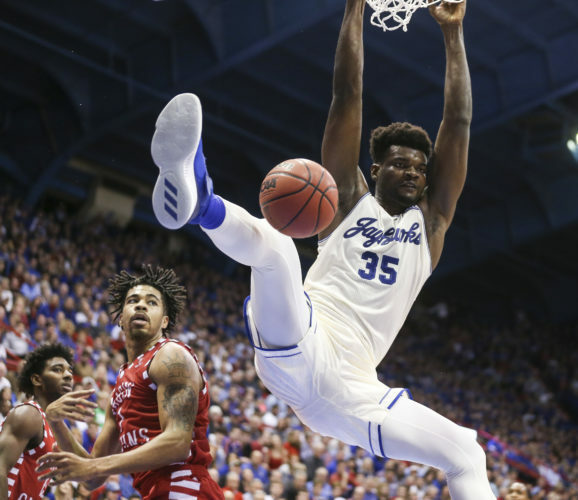 “It feels good to play with them, learn from their experience, get a good ‘learn’ in,” Doyle said with a smile, referring to the KU alumni players. He guarded Langford at times. “Man, it was hard. He didn’t really miss today,” Doyle said of Langford, who hit nine of 15 shots and swished three threes. Doyle impressed in front of 1,000 or so fans. 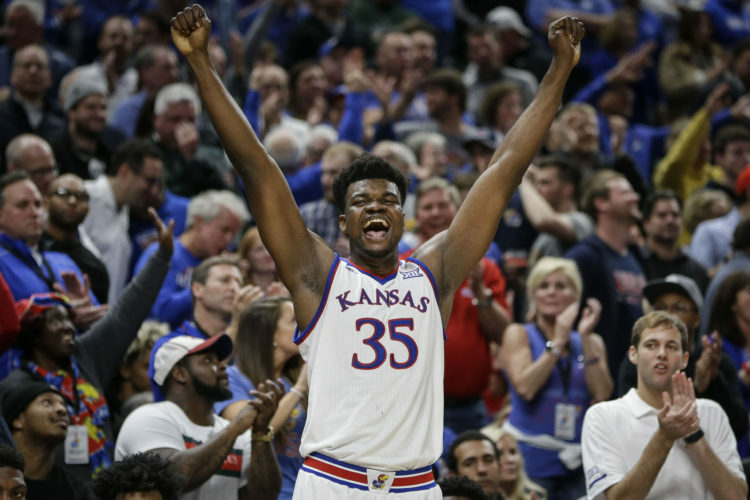 This, that: McLemore opened the scoring with a vicious dunk after a drive down the lane … Perry Ellis’ only bucket came off a spin move in the lane. 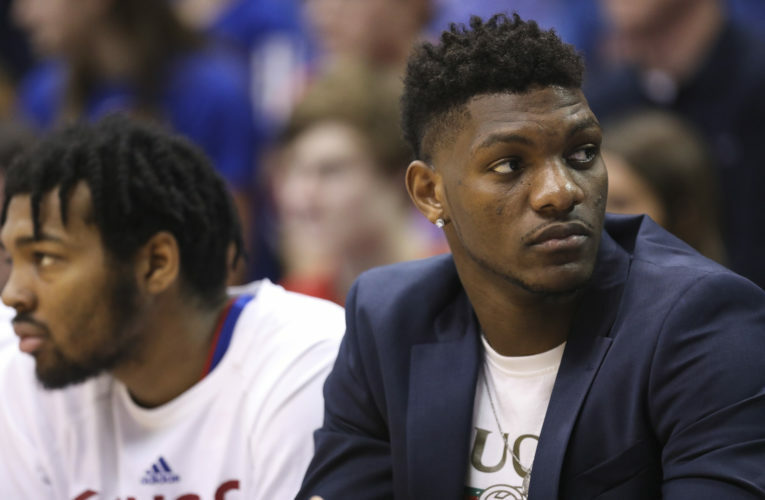 … Chicagoan Doyle hit Chicagoan Jamari Traylor with a pinpoint pass in the lane for a layup … McLemore iced a three from the corner. … Doyle had a steal and a dunk on the other end. … Collins will sign autographs of the book “Beyond the Phog” from 3-5 p.m. Saturday at Dillons, 3000 W. 6th Street. Ben McLemore 7-14 0-0 16, Jeff Withey 3-4 0-0 6, Travis Releford 4-9 0-0 8, Naadir Tharpe 4-6 0-0 10, Justin Wesley 2-4 0-0 4, Milt Doyle 3-5 0-0 8, Kevin Young 2-5 0-0 4, Jamari Traylor 3-5 0-0 6, Andrew White 1-5 0-0 2, Nike Roberts 0-3 0-0 0, Tyler Self 0-2 0-0 0. Threes: McLemore 2, Tharpe 2, Doyle 2. Russell Robinson 1-8 0-0 2, Keith Langford 9-15 3-4 24, Perry Ellis 1-3 0-0 2, Brady Morningstar 3-4 0-0 6, Aaron Miles 1-3 0-0 3, Zach Peters 2-4 0-0 4, Jeff Hawkins 4-6 0-0 10, Landen Lucas 1-7 2-2 4, Christian Garrett 1-1 0-0 2, Sherron Collins 0-5 0-0 0, Evan Manning 0-0 0-0 0. Threes: Langford 3, Hawkins 2, Miles 1.